Introducing the €1.5m, 1.5-tonne, 160kW amplifier | What Hi-Fi? As the name suggests, the annual High End Show, which opens in just over five weeks' time in Munich, is home to some of the planet's most exotic audio equipment. But even by the show's high standards, the Pivetta Opera Only, set to make its Munich debut this year, is something rather special. 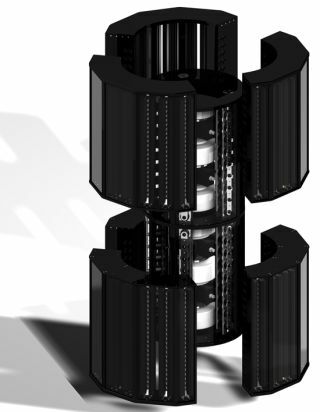 The 2.5m-tall, 1500kg amplifier, built at a cost of some €1.5m (£1.275m), is capable of delivering 160kW. And it does that either as two 80kW channels or in six-channel form, where it delivers 6x20kW in Class A, topping out at that 160kW total. Mad enough for you? If not, the amp stands a mere 1.9m tall, and is a 1.25m-diameter twelve-sided cylinder when in standby (left). Power it up, and it opens, dividing into six sections, and extends to its full height and a diameter of 1.85m, and is then ready for action. It's the brainchild of Italian electronics designer Andrea Pivetta – that's him above with the amplifier in full-on Tardis mode – , who has worked with a number of Italian companies over the past 20 years. It's a development of his earlier Opera One power amp, capable of 20kW in the form of 12 channels of 1600W each. The Opera One is yours for just £425,000 through worldwide distributor HigherFi. Only two small snags with the Opera Only, which is built from aerospace-grade aluminium – well, apart from all the obvious ones – : at the moment it's not for sale, and even if it were, it needs a 240V or 400V power supply rated at 800A. However, if your mains isn't up to that, Pivetta has also built-in a bi-power system, enabling it to deliver just 3kW from normal domestic outlets. Thoughtful, but wouldn't you always be thinking 'If only…'? The 2013 High End Show is at the MOC, Munich. It opens on May 9 (trade only), and is then open to the public from May 10 to May 12. For more information, visit the show website.